MADRID (AP) — More than three years after a botched fresco restoration by an octogenarian painter became a major tourist attraction for a northern Spanish town, local officials are looking to inject new life into the phenomenon by opening a center that celebrates the fresco. Borja Mayor Eduardo Arilla said 160,000 people had come to see the fresco since the story of Cecilia Gimenez's restoration of a Christ fresco in a town sanctuary went viral in 2012. He said with the new center, the town hoped to keep attracting up to 30,000 visitors annually. 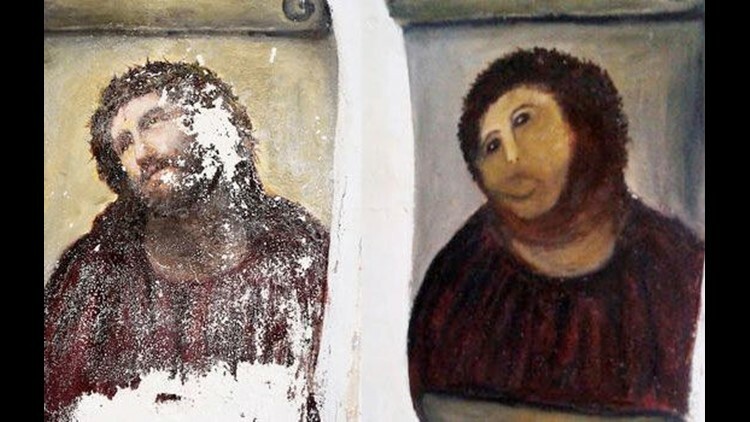 Gimenez became a sensation when pictures spread on the Internet of an "Ecce Homo" ("Behold the Man") mural she disfigured while trying to restore it. Twitter users redubbed it "Ecce Mono" ("Behold the Monkey"). "It's to give the painting a new impetus," Arilla told The Associated Press. He said Gimenez, 85, will be at the inauguration later Wednesday, along with the granddaughter of the little-known Spanish painter of the near 100-year-old original, Elias Garcia Martinez. The new center will bring together stories, photographs and videos documenting the impact of the restoration. Visitors will be able to see the fresco in the adjoining chapel — and for those feeling inspired, there will be canvases to try to paint your own version. The center will also display the fresco's new official merchandise — ranging from T-shirts to teacups — which also will be available on Amazon. Proceeds are to be split between Gimenez and the sanctuary's home for retirees.